This story pulled me in from the very beginning. Lies, betrayal, danger, intrigue. All these pieces of the puzzle unite to tell the tale of Eve Gardiner, an English spy during WW1, and Charlie St. Clair, in 1947 a privileged, pregnant and single American desperate to find her cousin, Rose, who went missing during the last days of WW2. Tediously working through various documents Charlie finds Eve’s name in connection to her cousin. Eve is bitter, a drunk, and less then receptive to Charlie’s request for help in finding Rose. Persistence eventually pays off and the two set off on a journey that takes them from England to the French countryside. Along the way each woman’s story comes to light. The fiction is peppered with real people, places and events; if you are a history buff you may wish to write down some of the names and places to look up afterwards. This story pulled me in from the very beginning. 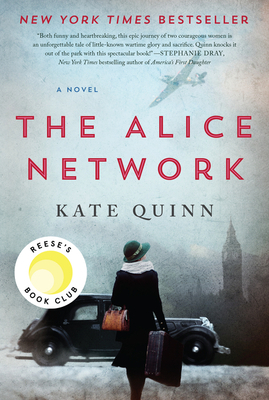 Lies, betrayal, danger, intrigue—all these pieces of the puzzle unite to tell the tale of Eve Gardiner, an English spy during WW1, and Charlie St. Clair, in 1947 a privileged, pregnant and single American desperate to find her cousin, Rose, who went missing during the last days of WW2. Tediously working through various documents Charlie finds Eve’s name in connection to her cousin. Eve is bitter, a drunk, and less then receptive to Charlie’s request for help in finding Rose. Persistence eventually pays off and the two set off on a journey that takes them from England to the French countryside. Along the way each woman’s story comes to light. The fiction is peppered with real people, places and events; if you are a history buff you may wish to write down some of the names and places to look up afterwards.